2 Tones. Dry-matt to touch. Protective formula for an even and matt appearance with a hint of colour, to strengthen the skin’s defences against the sun. The two colours adapt to the phototype of each skin with no artificial effect. Coloured facial cream gel Spf 50+ Very High protection. 50ml. Dry-matt to touch. Protective formula for an even and matt appearance with a hint of colour, to strengthen the skin’s defences against the sun. The two colours adapt to the phototype of each skin with no artificial effect. High protection against UVA/UVB rays with exclusive solar filters that are highly photostable to effectively prevent the skin from sunburn, the appearance of discolouration marks, and consequently the appearance of wrinkles and a loss of firmness. With active anti-aging ingredients (hyaluronic acid and vitamin E), acmella oleracea, Kigelia africana, biopeptides and reinforced filters. 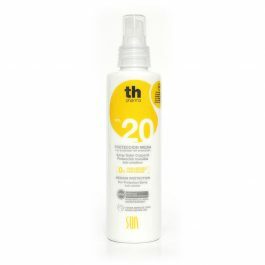 Sun Protection Spray Fps20 Medium Protection 200ml. Anti-cellulite. Water Resistant. 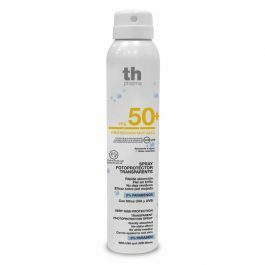 Transparent sun protection spray Spf.50+. 200ml. Th Pharma. Quickly absorbed – No-shine effect – No white residue – 0% PARABEN. 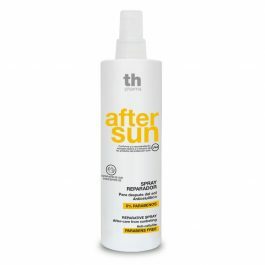 Transparent sun protection spray with a pleasantly fresh sensation. With UVA and UVB filters for maximum protection.